Georgina Bruni's now two decade old book linked earlier provides a short interview with Roberts aka J D Ingalls (where his first name went to, I don't know!). Ingalls was a member of the Security Police Investigations (SPI) squadron who Brenda had known for over a year. Initially after the incident at a New Year's party he told her that a UFO had landed. There were 3 entities around three feet tall in silvery suits that came out. They seemed to be floating in mid-air beside the craft within shafts of light and a senior officer was communicating with them. 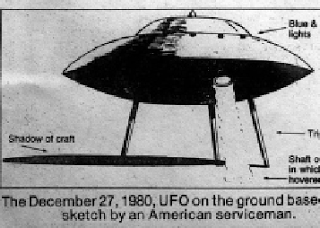 He was also responsible for circulating the saucer drawing that made it into the national press. This was done after he disappeared for 3 weeks in early Jan 1981 for 'special training' according to the story. He later changed this to say he was taken to an underground facility where he felt he was being brainwashed into believing the story was nothing important. However in 1987 he returned to Britain and told Brenda the story was a hoax. He had been told to spread stories by his superiors as something did happen. But this was unimportant and she was wasting her time. He later told Bruni in 1999 that he did see a UFO in the sky. There were no aliens though and only 5 men went out on the third night to investigate. It could be he was just trying to impress the locals with his tall stories. Maybe he was trying to help them out in a roundabout way. However another angle is that he might have purposely been spreading disinfo. Bruni also stated that he moved on to work for a "government contractor whose role is to secure classified projects". The Roberts story is much like the larger story. A mess. I didn't phrase that very well did I? That's one way of looking at it I suppose. The Cosmos rocket appears to have burned up and fell somewhere into the North Sea on it's flight path. However that wasn't really my point. It appears that nothing was picked up at the twin bases relating to the Cosmos 749 rocket to trigger a reaction. Otherwise activity would surely have been reported much earlier on Christmas Night? You would have thought so, wouldn't you? We can debate the timings of when the events of the first night began. But they all seem to point to around 3am from official witness statements and, if we accept other testimony, just after midnight. But you stated that Ian Ridpath's theory was that it was the reports of the Cosmos 749 rocket launch re-entry that led to the jitteriness that was then exacerbated by the 02:50 am bright object that only lasted for a few seconds and could only be seen through a screen of trees. Do we even know whether the "fireball" had been reported on the radio and that any of the airmen had been listening to the broadcasts? There were bright objects observed in the south of England at 17:20 on Christmas Day, and again at 19:20, in addition to the fireball at 21:08. At the same time as the fireball, bright objects were observed passing over Belgium, Germany and the Netherlands. I at least have an answer to my question about whether Burroughs said it was "comet-like" on that evening, even if he didn't say it, it seems to be an appropriate assessment. It was a busy night in the skies it would seem, what with the comet discovery and a possible nova. Or is there an indication of anything kicking off just after 9pm when the Soviet rocket booster was burning up? Assuming it did burn up that is. The men were already in the woods (by 02:44 from what I can gather) when the bright object that Ridpath claims accounts for part of the light display, but that leaves a lot of lights to be explained. If they had heard radio reports of the fireball, depending upon which witness accounts they heard, the ones later reported in The Sun perhaps, I think, from Canvey Island, then they may have indeed been "primed" to consider that a UFO crashing into the woods wasn't out of the question and given the path of the re-entry, it doesn't seem out of the question that something could have fallen in the woods. Colonel Halt in his 'Halt Perspective' memoir (well, not a memoir, more a 2-tonne brick with scattered personal comments among a mass of mostly irrelevant local sightings and gossip over 80 years) is very clear about Steve Roberts being J.D. Ingalls, and acknowledged that Ingalls was indeed at the base. I'd gladly quote from the text, but the trouble with that brick is that it's impossible to refer back to a particular page or section due to the book's chronologically inept narrative structure. Not to worry, that's grand enough. Jenny Randles makes a comment about how "impressive" Brenda Butler's information network was but it seems odd that absolutely no names appear to have gone on the record, (Randles explains at some length that this was Butler's choice, not the witnesses which only makes it odder, more suspect) and none of the initial accounts that she took from the witnesses that she spoke to seem to have been possible to verify. I have developed some doubts about Butler, at best I think she was played with/wound up, but I don't rule out that being six of one and half a dozen of the other too. However, that still leaves us with the chap who approached Begg and his wife in the local pub on 18th February 1981. According to Randles, it was only when she found out that other people were talking about an event at the bases that she broke her own promise to Roberts/Ingalls not to tell anyone what he had told her. Dot Street seperately recounts that it was also on the 18th that Butler told her about the crash. She was clearly champing at the bit to tell someone. The account given to Begg is alleged to have come from another source though, and offers a vaguer narrative. Given that Butler spilled the beans so quickly makes me suspect that she was told that only when it was mentioned by some else should she come forward. Like she had been waiting for a cue. Purely speculative of course, but what about RFI isn't? ...you stated that Ian Ridpath's theory was that it was the reports of the Cosmos 749 rocket launch re-entry that led to the jitteriness that was then exacerbated by the 02:50 am bright object that only lasted for a few seconds and could only be seen through a screen of trees. Do we even know whether the "fireball" had been reported on the radio and that any of the airmen had been listening to the broadcasts? The security guards could well have heard these reports. So when the (natural) fireball appeared at 3am the following morning they were already primed. The guys might well have heard these reports before they came on duty on the radio. That's Ian's theory. But I have never heard anyone mention hearing earlier reports of UFOs. A number of witnesses have said that Heathrow Tower reported something to them that was tracked over the base. That story seems to have never been followed up and remains anecdotal. ....Assuming it did burn up that is. The men were already in the woods (by 02:44 from what I can gather) when the bright object that Ridpath claims accounts for part of the light display, but that leaves a lot of lights to be explained. The witness statements confirm Burroughs reporting strange lights in the woods around 3am. WIth the exceptions of Penniston's testimony where he seems to believe things started just after midnight. Halt has it all starting the following day at 03:00 in his memo. So 02:44 could well be correct. The real problem is the following nights. There were no booster rocket burn-ups or unusual celestial displays in the sky. Nor are any witness statements publicly available from those nights. Even Burroughs, who was present on both nights, only talks about the first night in his statement. Why did he not mention the later night's events? All we have is Halt's tape and his memo (which is seemingly inaccurate with its dates). Even Burroughs, who was present on both nights, only talks about the first night in his statement. Why did he not mention the later night's events? All we have is Halt's tape and his memo (which is seemingly inaccurate with its dates). The frustrating aspect of Burroughs and Penniston's statements is that they are BOTH undated. Did they not say they made the statements the following day (26th)? Or even the 27th? That would still predate the 27th/28th night of Halt's trek. EDIT: Oh, you mean why did Burroughs not make a second later statement? There were rumours that numerous statements DO exist for the third night, but is that idle, unsubstantiated gossip? I can't recall who mentioned it - was it JB on a radio show? Oh, and Cabansag's was undated, too. Add in Halt's ham-fisted dating on his memo, plus the fact that Lt Buran and MSgt Chandler never bothered to write anything until 2nd January, and it all sounds extremely sloppy and, yes, unprofessional. Especially for blokes guarding a nuclear weapons stockpile. Well, yes, there IS that possibility, too. You could try a cold beer for your morning beverage. From what has been said (again in Georgina Bruni's book "You Can't Tell the People" linked above) it states that the men were given a break of 6 days after the incident. This would tie in with Burroughs story that on the 3rd night he was in civilian clothes and went up to the base to see if something was going on. It doesn't prove it of course but would also suggest all the statements were compiled on January 2nd 1981 (after the 6 days break) by Halt. So why was nothing mentioned about the "Halt night" at all? Did he not interview the others involved on that night? Somewhere there must be more documentation on this case. There is a lack of adherence to procedure when recording witness statements. The fact that only the commissioned officers' statements were recorded on official stationery should raise concerns about lack of attention to detail. Halt has stated he was apparently unaware that one of his officers resigned from the Air Force due to trauma (Tamplin) shortly after the incident. Which I found unbelievable. Following that he dithered on sending a memo for nearly 3 weeks. It probably should have come from the Base Commander Ted Conrad, but he obviously wanted to distance himself from the whole thing. The date of the first night is incorrect in Halt's memo when he says "Early in the morning of 27 Dec 80 (approximately 0300)....”. It is even inconsistent with itself when he says "The following night (29 Dec 80) the area was checked for radiation”. Halt also bemoaned the fact that the UK MoD did nothing on receipt of his memo. But he doesn't actually ask MoD to take any action. It was in effect just a statement and the MoD treated it as such. Problems from the very earliest days following the incident. Not forgetting there was an SPI officer telling locals tall tales of a UFO landing in the forest. I can feel my brain bleeding again. Perhaps my brain has packed in completely but I have no idea what you mean, Baa. However, I can imagine Penniston and Burroughs sitting in an English pub saying, "You limeys call this a COLD beer? Mannnn, this is ****Ing TEPID!"